The team traveled over for our sixth visit to Atlanta, Indiana to investigate the Roads Hotel. So why do we go back there? It's an interesting place. History of the building is fun to research. Activity at the building isn't overly impressive, but there is something about the place. Experienced, skeptical investigators have felt such an overwhelming urge to leave, that investigations have been cut short. Ghost Box responses (of which our team generally never uses) have been interesting in the past. EVPs and some DLSR photos have certainly been interesting. Here are a couple of thermal image captured just this past weekend. What do you think they show? 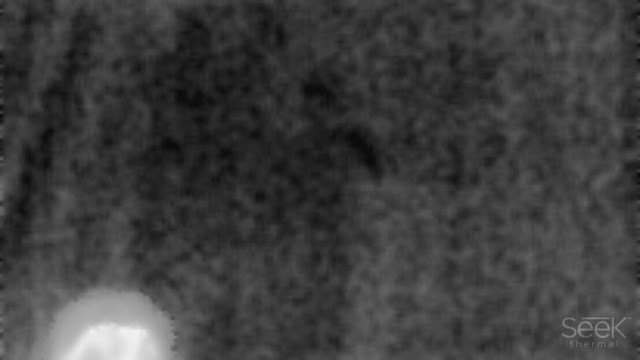 The first photo is the top of the head of one of our investigators (white is hot, black is cold) and the cold spots above her head appeared and when we asked her to move away, those spots disappeared as well. 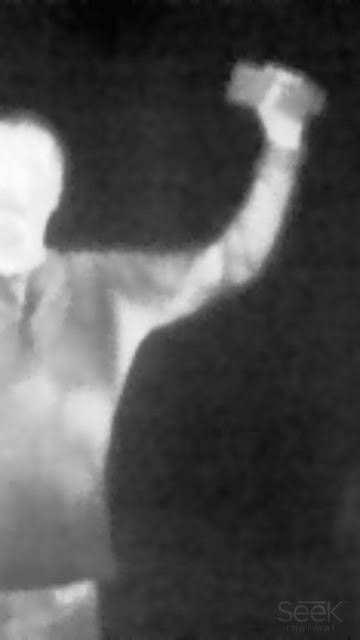 The second photo shows another investigator talking about the cold spot to his left and he was moving his arm up and down to determine how big the cold spot felt. We can see how black it is. We think we also see something else. We haven't fully reviewed our audio to see if we captured anything there, and we may decide these images ultimately do not show anything of interest. However, we currently believe we see something in these. As good investigators, we certainly are open to finding that our initial conclusions were flawed. We'll see if we find any audio to back up our theories.